Want to boost your public relations acumen? One of the best ways is to stay on top of key PR industry blogs as well as more general sites that offer a fresh take on business, creativity, and content. Why limit yourself to PR blogs when there’s a whole world of interesting stuff that can offer important information as well as increase specific skill sets? Read on to start creating your own PR blogroll. Of course, the sectors that are relevant to the practice of public relations are unlimited, but for practical purposes we’ve divided our top selections into three categories. The Holmes Report blog is written by the staff of the Holmes Report, which bills itself as “the authoritative voice of the global public relations industry.” The blog is a reliable source of macro PR information and industry trends. While we’re always interested in the report’s stories on PR innovation or the latest reporting on “fake news,” we really like the Report’s Echo Chamber podcast, which features guests from across the PR and marketing spectrum and tackles topics like the industry’s gender pay gap or the latest on brand research and polling. The Muse addresses all aspects of work and career life. Not strictly PR, but that’s one of the reasons we like it. It covers everything from productivity and presentation tips to super practical nuts and bolts advice on email and correspondence. No matter where your company is in its relationship with employees, service providers or clients, The Muse has relevant content. And, one of the best things about The Muse? The site is always looking for contributors, making it a go-to for thought leadership pieces and guest blogging. 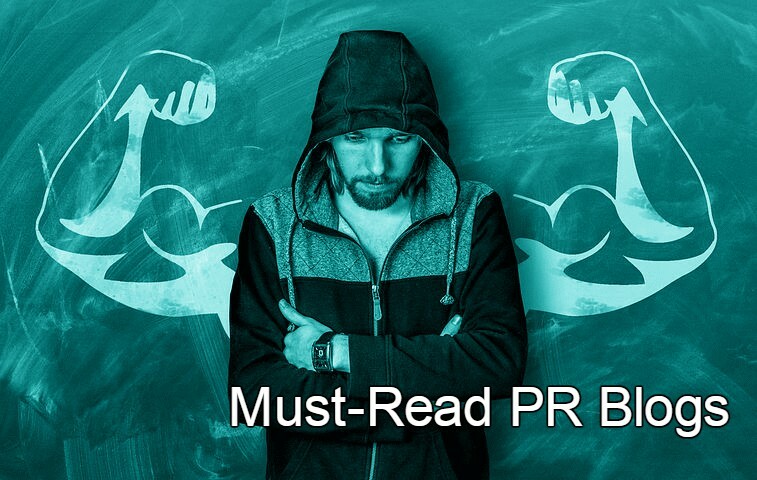 For a better understanding of the mechanics of PR, from creating media pitches that work to delivering a well-crafted results report, no one does it better than the Cision Blog. PR teams know Cision from its “day job” – offering PR and marketers media databases and analytic tools – and those functions position it well to cover best practices in easy-reading posts. Check out ones like this for fixing your influencer marketing or this post on advances in PR measurement. This blog is full of content to help teams be more creative. For starters, we like its suggestion for refocusing by visiting Donothingfor2minutes.com, which is pretty much exactly what it says, a timer to count you down while you stare at waves. After you’ve become very calm and want to get down to the business of ideation, learn to play a couple rounds of the Japanese word game Shiritori. It’s simple – think of a word that starts with the last letter of your opponent’s word and win by picking longer words and answering as fast as you can. This brain exercise is touted as “a foolproof way to come up with new solutions and original ideas.” Learn to play here. Hmm, you might say, Buzzfeed? That compendium of millennial listicles and goofy articles like this one on dads and babies? Well, it turns out there’s much more to Buzzfeed. Staying on top of its “finger-on-the-pulse” pop culture pieces will make a better PR person out of you, and it might even provide some story angles on topics you might not have thought about. Does your company have a stake in the current opioid crisis? Here’s a compelling examination of that hot-button issue that may offer inspiration. And if you’re brainstorming for story ideas on lighter fare, have a look at Buzzfeed’s famed LOL, WTF or OMG sections. The Boing Boing blog is an eclectic compilation of mostly weird and under-the-radar entertainment, political, sports and science stories usually illustrated with video. We recommend it simply for the pleasure of letting your mind wander while reading in the hopes that a great creative idea will strike. Start with this post titled “The Wheel of Feelings” and see if it doesn’t spark a story idea or at the very least, help with some interesting vocabulary choices. This awesome blog is a how-to for brands looking to package and distribute the best stories from within their organizations. Its digestible posts help marketers with the fundamentals and the blog takes readers’ busy schedules into account with easy-to-implement advice. Posts run the gamut from writing advice like “How to Write Clickworthy – but Clickbaity – Content” to marketing your efforts with topics like “What’s the Difference Between Promotion and Distribution Strategies in Digital Marketing?” Finally, writer Christoph Trappe also includes a handy index of social media, content and storytelling terms that are very helpful for clients and agencies. It may not be much to look at – a very simple site – but what Smart Blogger lacks in visual style it makes up for in very valuable information and “how-tos” on every aspect of blog writing. Start with the must-read compendium of “Blog Post 101” tips – How to Write a Blog Post – The Ultimate Guide and progress to posts on eliminating “flabby” writing and being a better editor. Company blogs are no longer a luxury, and this site can be a terrific resource for teams looking to start a new blog or improve an existing one. How does Media Shift, a blog billed as “telling stories of how the shifting media landscape is changing the way we get our news and information” help PR teams write better? The “shift” lies in the blog’s expert use of correspondents who explain how traditional media — newspapers, magazines, radio, TV, even music and movies, are dealing with digital and working in a more mobile, networked world. These posts help PR writers come up with more relevant story angles and media pitches and craft them in a way that is more likely to gain journalist attention. A great example is this post on “engagement journalism.” The in-depth post explains the concept: journalism that combines the power of community engagement with traditional news reporting. And it also features interviews with reporters to help readers gain a better understanding of how this kind of reporting impacts them. Smart PR people take note.